The fastest single-cylinder motorcycle in the Grand Prix era of TT racing will be reunited with the Mountain Circuit at this year's Classic TT presented by Bennetts, when the "Wagon Wheels" Arter Matchless G50, on which Peter Williams lapped at 102.74mph in the 1973 Senior TT, appears in the Lap of Honour on August 31. The bike will also be reunited with Williams, now 70, the gifted rider/engineer who developed the cycle parts of the 53bhp two-valve machine. Williams pioneered the use of cast-magnesium wheels in motorcycle racing, which earned the Arter G50 its Wagon Wheels tag, after the popular chocolate biscuit of the day. Robert Iannucci, the New York tuner-collector who owns Team Obsolete, is bringing the Arter G50 back to the Isle of Man for his regular rider Dave Roper to use at the VMCC Festival of Jurby on Sunday 28th August and the Classic Racer Lap of Honour on Monday 29th August. 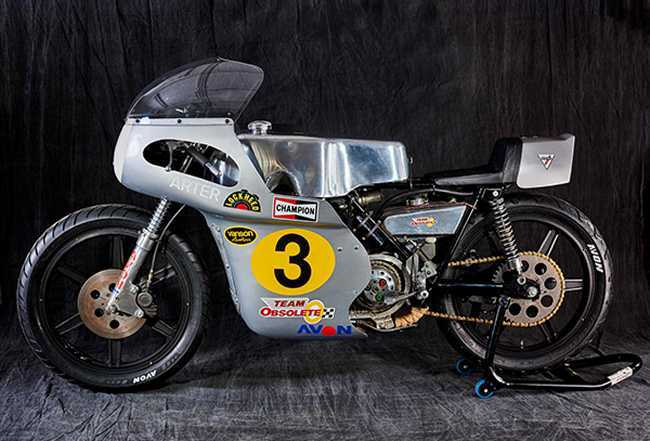 "This is the greatest classic single-cylinder bike that ever ran at the TT," Iannucci said. "People are going faster today on exotic highly modified singles, but Peter and Tom Arter, who was an amateur tuner and sponsor, had just the standard bore and stroke G50 engine." "Our bike was the most advanced single of its time, a fantastic machine. Having built it myself and ridden it, it was like a friend, and it certainly behaved like one. On the race track it never let me fall off, even if I rode it at ten-tenths or even at eleven-tenths." Williams certainly took his performance to the ten-tenths level when he tried to beat Jack Findlay, who was riding a 75bhp Suzuki TR500 twin, in the 1973 Senior. Williams' was slowed by mechanical problems, but as well as his 102.74mph lap he also set the fastest race speed ever until that time on a single-cylinder bike, at 100.62mph. After 1973 single-cylinder four-strokes were no longer competitive in the Senior, and it wasn't until the late nineties when his lap speed was bettered by a 500 single, in the Classic Manx Grand Prix races. 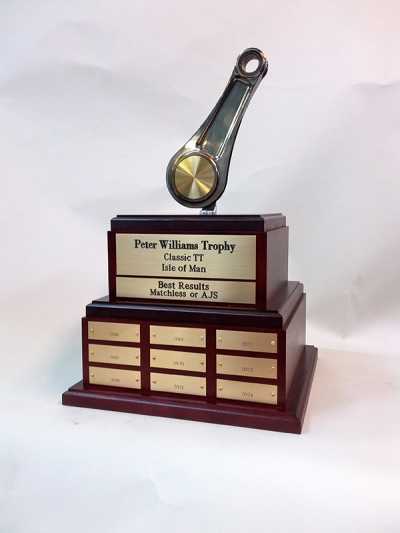 A great enthusiast for AJS and Matchless race bikes, Iannucci has created the Peter Williams Trophy from a titanium conrod. 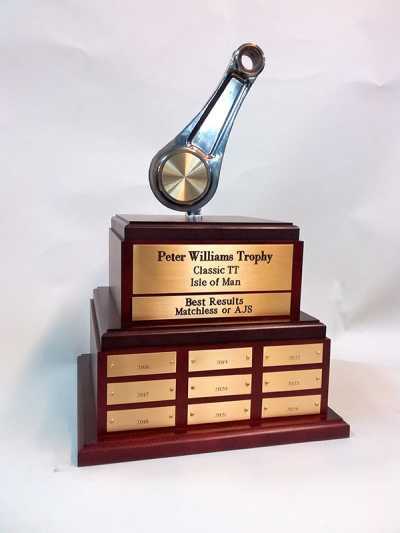 The award will be presented by Peter Williams to the best-placed rider AJS or Matchless rider in either the Junior or Senior Classic TT races.